Published: April 14, 2019 • Modified: April 23, 2019 • by Author: Analida • Word count:1289 words. • About 7 minutes to read this article. 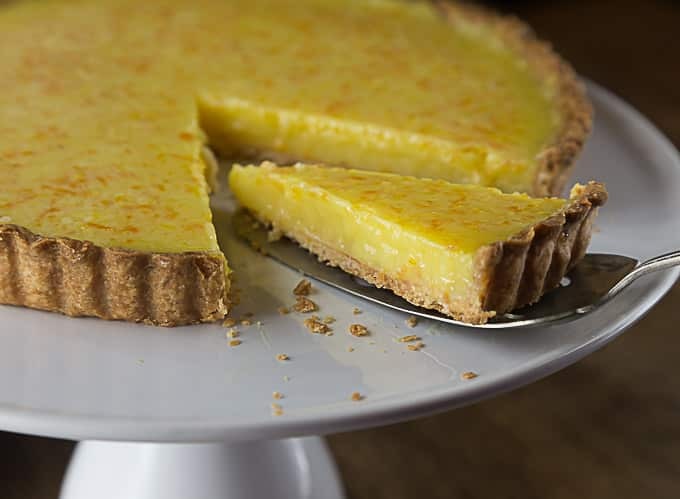 This perfect lemon tart is one of my favorite desserts. 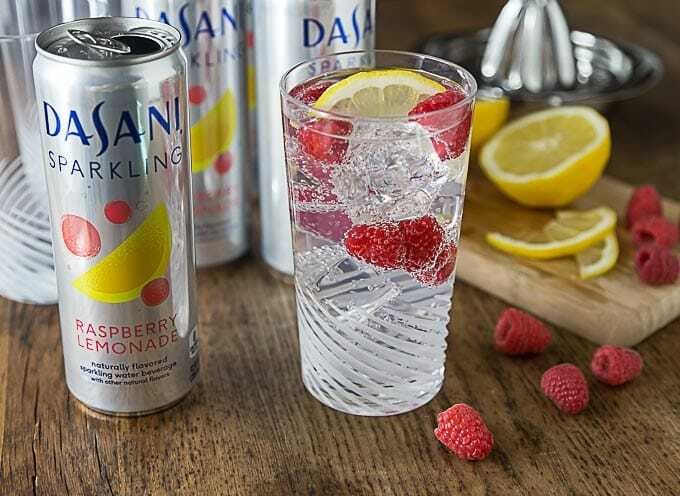 It’s tangy, sweet, and delicious. Basically, I love anything lemon. 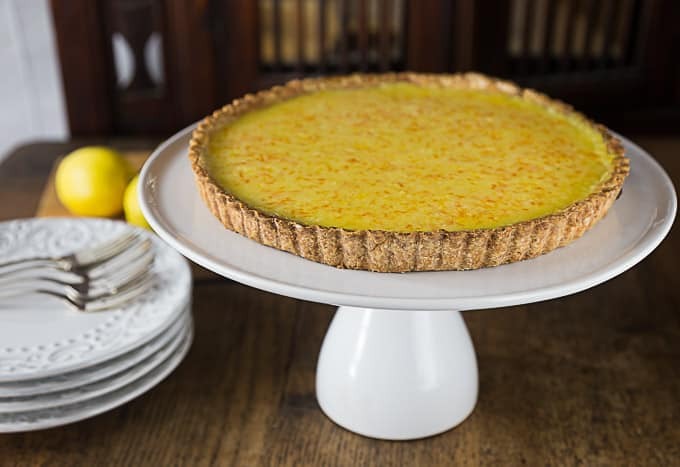 This perfect lemon tart has the added bonus of orange juice and zest in it. So, with all this vitamin C, I like to think of it as healthy, sadly it’s not! sigh. My husband makes this dessert for me. He just made it for mother’s day. What a great gift! The people in my office thought so too, of course. I took the rest of this perfect lemon tart into work on Monday. It was gone quickly. One of my colleagues lamented the fact that he waited too long (until after lunch, seriously!) to get a piece. When he finally made it over to my office it was gone! He left my office with a sad look on his face. Although we tend to think Florida and California when we think of citrus fruits, their origins are actually from far away lands. Oranges are thought to have originated in Malaysia (SE Asia). They eventually made their way to China around 2200 B.C. where they were offered as tribute to the emperor. These early oranges were admired for their medicinal properties and the aromatic value of their essential oils. Lemons, on the other hand, are thought to have originated in Northern India and are thought to be a hybrid between a bitter orange and citron (a fruit similar to lemon, but less acidic and more fragrant). Don’t let the many steps you see here scare you.It’s actually pretty easy to make, but like all good things, it takes a bit of time. 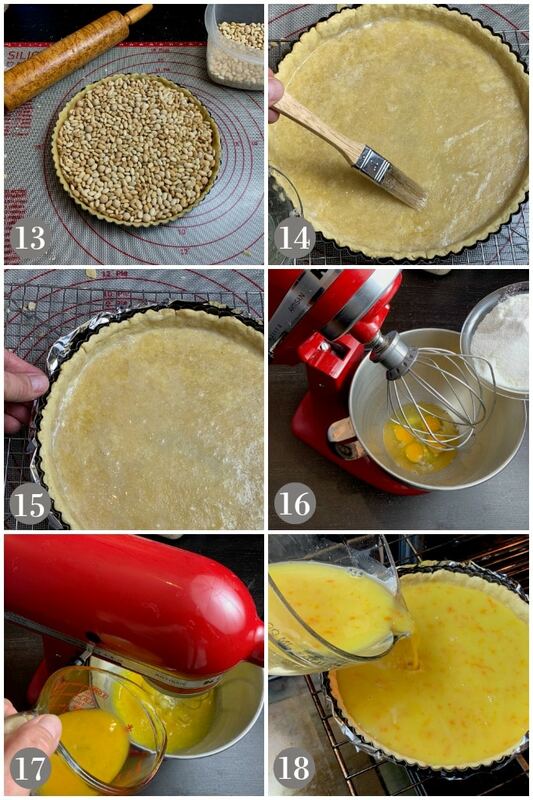 When you are ready to fill the tart for baking, pull out the oven tray and place the empty tart shell on the rack. Place the filling in a pitcher and pour over tart shell. This will prevent possible spills. I learned from experience! 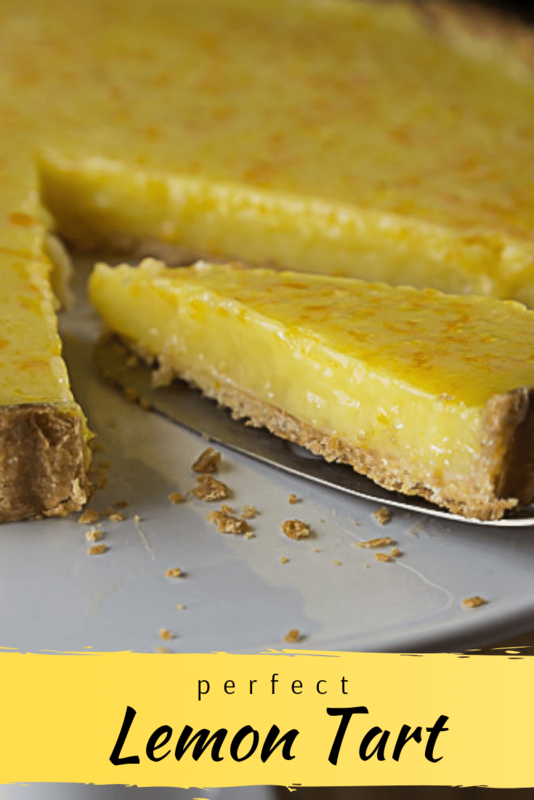 This perfect lemon tart is really to die for. Step 1: Place the flour, sugar, salt, and butter in the food processor. Pulse to combine until it looks like a coarse meal. Add the egg yolk and milk. Pulse a few times. Step 2: Pulse it again and you may need to add a little ice water, 1 Tbsp at time, just until the dough forms a ball. Step 3: Turn out the dough on a floured surface. Step 4: Form the dough into a disc. Step 5: Wrap the disc with plastic wrap and refrigerate for 1 hour or even overnight. Step 6: Take out the chilled dough and roll out into about a 12 inch circle. This will fit nicely into a 10 inch tart pan and fill the sides. Step 7: Lay the removable bottom of your tart pan on the rolled out dough to size it up. Step 8: Slide the tart pan bottom under the dough. Step 9: Here is my hack/tip: Gently fold up the dough on the removable bottom and center it. Step 10: Drop the removable bottom with the dough into the outer tart pan. Step 11: Gently unfold the dough out to the edges of the pan. Step 12: Press the dough firmly into the sides of the pan and trip excess on the top edge. You can use small trimmed pieces to fill in any areas on the sides that are a bit thin or come up short. Step 13: Place a circle of parchment paper in the bottom of the tart pan then place pie weights or beans insde then bake for 20 minutes in a 350’F oven. Step 14: Remove the tart shell from the oven, remove the pie weights and parchment paper. While the tart shell is still hot brush with the egg white and this will seal the shell and help prevent any leaking. Step 15: Place some aluminum foil around the bottom and sides of the tart pan just is case there is any leaking. Step 16: Mix the filling. (These step can be down while the shell is baking.) Place the eggs and sugar in a mixing bowl with the whisk attachment and slowly combine. Step 17: When the sugar has been integrated with the egg, add the lemon juice, orange juice, cream, lemon zest and orange zest. Whip slowly until smooth. Step 18: Transfer the filling to a pitcher. This will make the shell very easy to fill. Place the tart shell in the middle rack in the oven. Pour in the filling and gently push the rack in and bake for 20 minutes or until set. You can check if the filling is set by jiggling the oven rack. If you see the filling swirl like ripples on a pond it is not set. If it jiggles like jello then is it set and you can take it out to chill. If you want you can whip up some heavy cream and place a dollop on your tart. It’s awesome, trust me! With summer right around the corner, this is a perfect dessert to take anywhere. A tangy and rich lemon dessert that is the perfect ending to any meal. A little piece goes a long way. Try it now. In a food processor place the flour, sugar, salt and butter. Pulse a few times until it resembles a coarse meal. Add the egg yolk and milk. Pulse until the mixture comes together into a ball. You can add a bit of cold water (1 Tbsp. at at time) if it is having difficulty coming together. 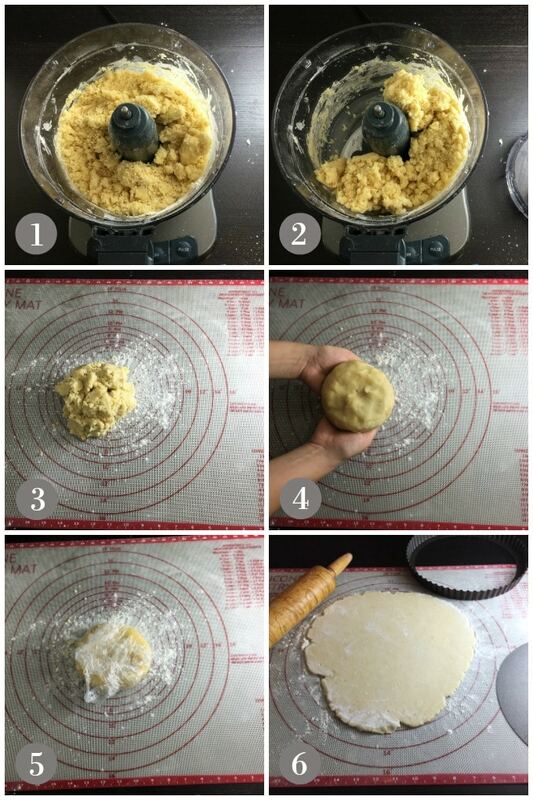 Take the ball of dough and flatten it out lightly on a lightly floured surface. Wrap it in plastic and place it in the refrigerator for about one hour or overnight. Take dough and allow it to come to room temperature. Preheat the oven to 350'F. On a floured surface start rolling out the dough to make a 13" circle. Place in a tart shell. Place a piece of parchment paper or foil on top of the shell. Fill with pie weights or beans. As soon as the shell comes out of the oven, brush with egg white. 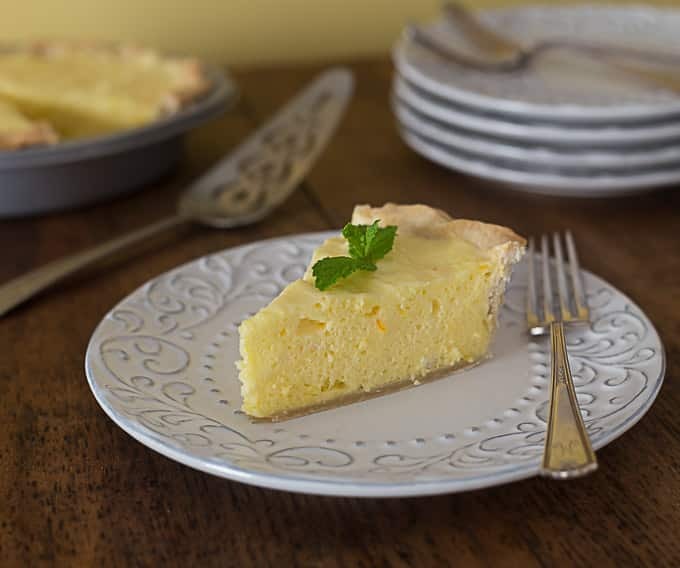 While the pastry is baking whisk together the eggs, sugar, orange juice, lemon juice, lemon zest and orange zest and cream until smooth. * Check with a toothpick after about 20 minutes so you don't over bake or see my notes on the "jiggle" test below. 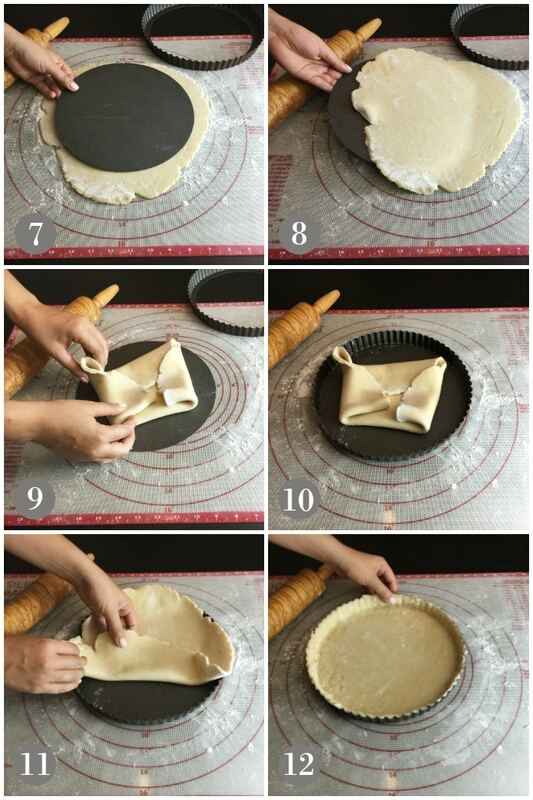 When you are ready to fill the tart for baking, pull out the oven tray and place the empty tart shell on the rack. Place the filling in a pitcher and pour over tart shell. This will prevent possible spills. You can check if the filling is set by jiggling the oven rack. If you see the filling swirl like ripples on a pond it is not set. If it jiggles like jello then is it set and you can take it out to chill. This looks, and sounds, wonderful! I can’t wait to try it. The addition of orange is brilliant! Thanks for the recipe. Thanks Jeannie! It is really delicious and refreshing too!! Great info about citrus fruits. My son and sister are lemon obsessed so this is great for them! Hi Kristen! thanks for commenting. I hope your sister and son like the lemon tart. This sounds soooo good. I always love chocolate desserts, but when I go for something not chocolate it is almost always lemon! I love lemon too! I feel like it’s healthy just because it is lemon which has vitamin C.
I LOVE lemon curd. This tart looks amazing. This is the perfect dessert for me and hubby (we both love lemon pie). 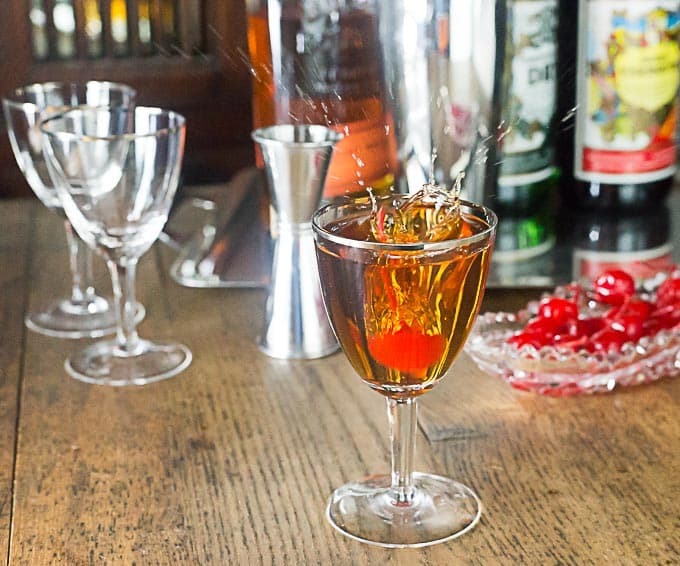 I think I need to make this ….really soon. Hi Gloria! Thanks so much for commenting. I am so glad you like lemon desserts. They are actually my favorite. Let me know how you like it. This tart is beautiful! The fresh zest is perfect, and I can imagine the wonderful things that heavy cream does. Thank you for your kind comments Dixya. Let me know how you like it. 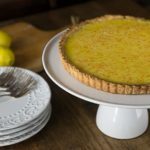 I love a lemon tart, they are so perfect for a brunch gathering! Thanks for the recipe, I look forward to giving it a try! Your name for this is spot on – it is ‘perfect’! Saving this one for Spring. Thanks Sharon!!! Spring is just around the corner. Lemon has always been one of my favorite dessert flavors. Great spring dessert! Lemon Tarts are AMAZING and my FAVORITE! What a beautiful looking tart! I have such the sweet tooth and I’m tempted to walk into my kitchen right now and make this!! Beautiful! I must confess… I am not a dessert maker (especially baking), but this is so pretty, and I love lemon! I might be tempted! Hi Tamara! I think you need to make this Perfect Lemon Tart. Freshly squeezed orange and lemon juices make a lot of difference. And i can see how tangy and sweet the tart is. so full of flavor! Yes, fresh squeezed makes a huge difference. Tangy and sweet is awesome! 🙂 Thanks for commenting. Wow the photos makes me drool! This lemon tart makes my tummy go crazy for it. Thank you for sharing this recipe and some information about citrus fruits. Gonna beg my mom to make me some of this since I’m not good at baking hahaha.